I know it has been awhile since I have written, but a lot has changed over the past year. Not only am I working, but I have gone back to school to get my teaching license. All the craziness aside, I have a wonder book that I simply had to take the time to tell you about, Listen, Love, Repeat by Karen Ehman. I have had the privilege to not only read her other books but also meet her a few years ago at She Speaks when I was working with Proverbs 31 Online Bible Study. I am drawn to her books because the reader can relate to her and this one is no exception. Karen is real and engaging. It is like sitting down to coffee with a friend. Listen, Love, Repeat is about taking the time to get outside of ourselves and listen to others and then love on them. I like the way Karen puts it – “a heart drop”. This is when you get to peek into another person’s heart. However, you can’t stop at just looking, you must be sure to listen. One of my favorite quotes sums up this point, “Living our lives prayerfully, preparedly, purposely, and perceptively will help us to tune our ears to the heart drops of others, so we can respond to their deepest needs in a meaningful, Spirit-centered way” (p. 30). Each chapter is the book has practical tips and ideas of ways to apply the principles to your life. There is also a prayer at the end of the chapters. In addition, Karen has included bonus material at the end of the book – memory verses, quotes, recipes, and gift tags. This is not just an incredible book, but there is also a DVD Bible Study. You will be able to gather your friends together as Karen guides you through the book week-by-week. For more information and to preorder the book visit Karen’s website, http://www.listenloverepeatbook.com/. I highly recommend you purchase the book as well as DVD study. 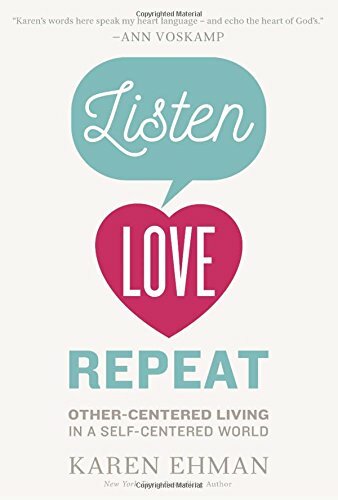 In fact, it is so good that I am giving away a copy of Listen, Love, Repeat on my blog. To enter, simply share a way you can value others this holiday season in the comment section. I will announce the winner next week. I was just thinking about a dear friend this morning who is going through a tough time mentally, physically and emotionally and thinking about doing the 12 days of Christmas for her.